Some years ago we told you about comic creator Mike Norton and his series Battlepug — a web comic so popular it was making its way to print media. 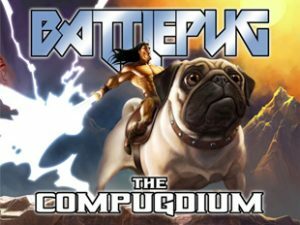 Well now thanks to Image Comics we have the complete series put together in Battlepug: The Compugdium. (We don’t make this stuff up, folks.) “At long last, Mike Norton’s award-winning fantasy/humor web comic is collected in one volume! Join the last Kinmundian and his faithful steed, The Battlepug, as they travel the globe seeking revenge against every giant ridiculous animal they can find. Featuring extras like sketches and art by some of the most creative artists in the business today! Collects the entire 5-volume original series of Battlepug!” It’s coming to stores later this month in hardcover. We came across this new 6-issue comic mini-series at a bookstore! “Auntie Agatha’s Home for Wayward Rabbits is in danger. 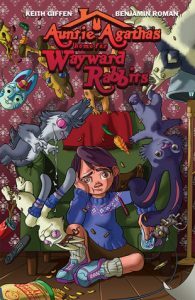 Run by the titular Agatha and her niece, Julie, this peculiar shelter cares for damaged and dysfunctional rabbits — and now it’s being threatened by a wealthy businessman who will stop at nothing to tear it down.” Auntie Agatha’s Home for Wayward Rabbits is also the latest comic series from famed writer Keith Giffen, helped out by artist Benjamin Roman. It’s available now from Image Comics. A classic folk tale comes to us in the form of a new full-color graphic novel series courtesy of Image Comics. “The sibling writer/artist duo of Cat Seaton and Kit Seaton (AFAR) team up for Norroway, Book 1: The Black Bull of Norroway, the first in an original graphic novel series based on the Scottish tale of the same name. Sibylla had always craved adventure, but she never guessed it would show up at her door in the form of a giant, magical bull. Who knew a prophecy could be so literal?” The first book is available in trade paperback. 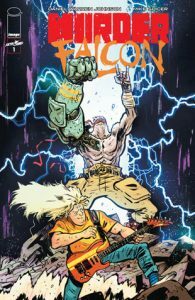 Heavy violence meets heavy metal in Murder Falcon, a new full-color comic series from Image. “From Daniel Warren Johnson, the creator of the Eisner-nominated series Extremity, comes Murder Falcon! The world is under attack by monsters, and Jake’s life is falling apart: No band, no girl, no future… until he meets Murder Falcon. He was sent from The Heavy to destroy all evil, but he can’t do it without Jake shredding up a storm. Now, with every chord Jake plays on his guitar, the power of metal fuels Murder Falcon into all-out kung fu fury on those that seek to conquer Earth. It’s time to shred!” You heard it here — Loudly! Check out the preview video too. 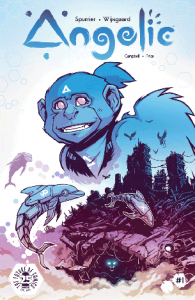 Here’s another one that Previews alerted us to: Unnatural is a hit full-color comic series in Italy, and now Image Comics is about to unleash it on North America. “Leslie is a simple pig girl. She loves sushi, she’s stuck with a job she hates, and she lives under a brutal totalitarian government – one that punishes transgressors for anything deemed ‘unnatural’. Leslie dreams of something different for herself. 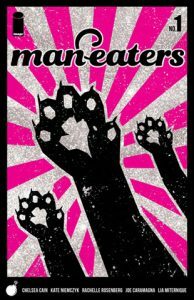 But those dreams are becoming dangerous…” Interestingly, writer and artist Mirka Andolfo says that none other than Omaha the Cat Dancer (by the great Reed Waller and the late Kate Worley) served as an inspiration for this series. Look for it soon in stores. Once again, from out of nowhere, this one. We’ll let Image Comics explain it: “Journey into the thrilling world of international espionage as one of Britain’s most covert MI-6 divisions, The Nest, recruits a brand-new secret agent to their team: SPY SEAL! 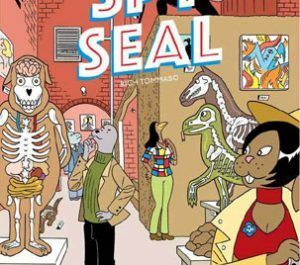 An exciting new comic series-reminiscent of The Adventures of Tintin and Usagi Yojimbo.” Spy Seal is written and illustrated by Rich Tommaso (She Wolf) and the first full-color issue is available now.